1. Margaret Ville is a single 40 storey block Luxury Condo develpment by MCL Land of Hongkong Land Holdings. 2. 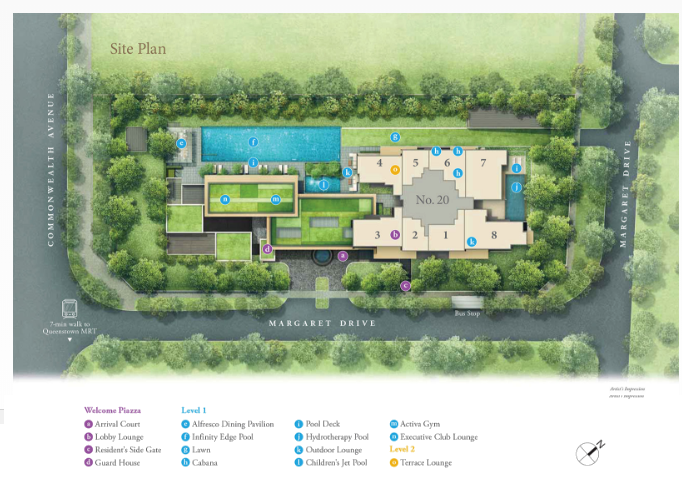 One of the most recent completed project by MCL Land was Sol Acres EC. The largest EC in Singapore at Choa Chu Kang. 3. 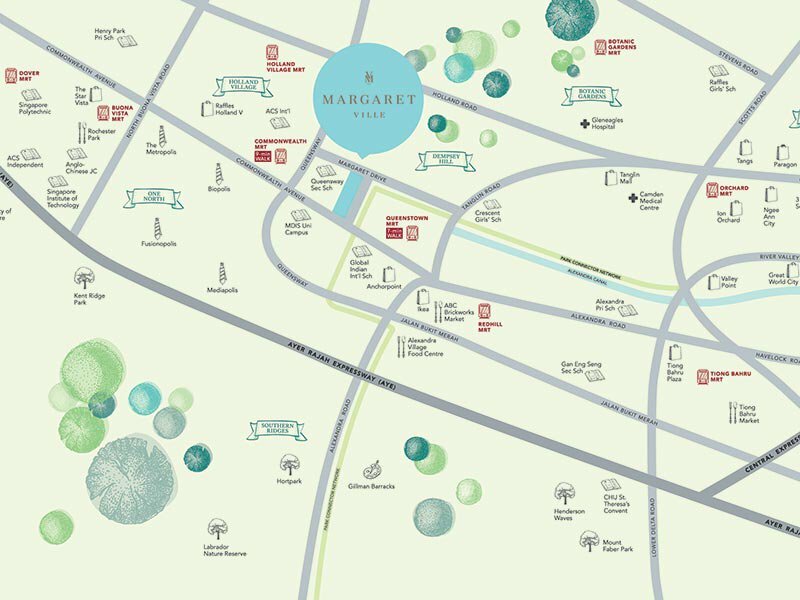 Margaret Ville is a 99 years leasehold property with a total of 309 residential condo units. 4. Estimated T.O.P. is in December 2021. Or under Flying Stars Feng Shui is under the last three years of Period 8. (Period 9 stars from year 2023). 6. This development sits on a perfectly rectangular plot of land. 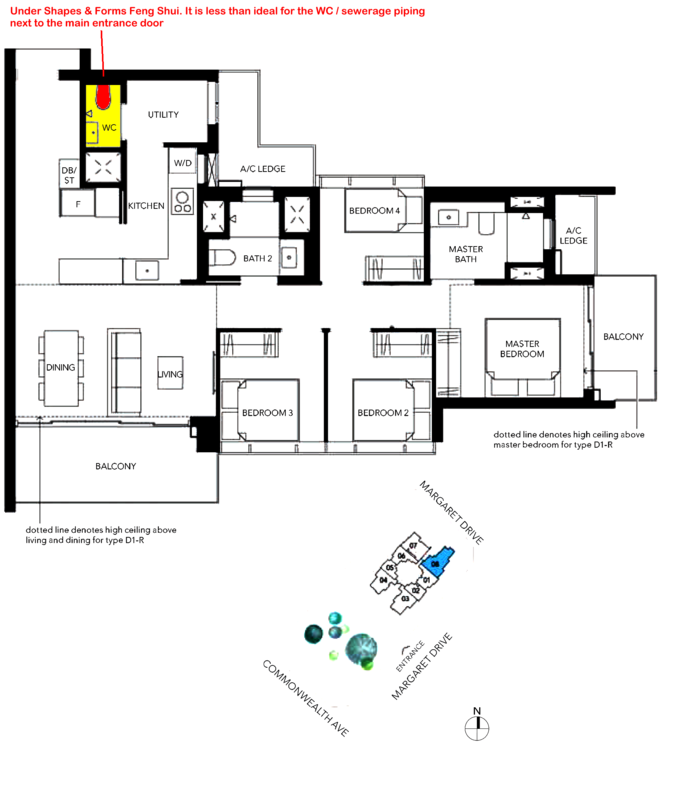 Which is a plus under Shapes and Forms Feng Shui. 7. As compared to many recent launches in Serangoon. Where the plots are irregular in shape. Such as the Affinity and Garden residences. 8. Under Shapes and Forms Feng Shui, it is equally favourable that this is a single block of flats. 9. Such a single block is good as it allows for natural flow of qi around the entire block vs developments where several blocks are clustered together. 10. Under Shapes and Forms, it is good that the developer has placed the single block closer to major Margaret Drive (Northerly) vs placing the block closer to the busier Commonweath avenue. 11. This simply means that the stacks closest to Commonwealth avenue will not be affected by the busy traffic on this road. Instead, the less traffic service road: Margaret Drive. Part 2: Formerly the plot odd land that Margaret Ville Condo now sits on used to be part of (school field) Queensway Secondary School . 1. Above this plot was New Town Secondary School. Queensway Secondary School is still there today: Northwest of Margaret Ville. 2. Margaret Drive got it’s name from Princess Margaret, Countess of Snowdon. 3. Princess Margaret happens to be the younger sister of the present Queen Elizabeth. In fact many of the nearby surrounding areas were named after the royal family like Prince Charles Square., Prince Philip Avenue etc..
4. Thus for those who are not aware of how Margaret Ville got it’s name. 5. In 1966, this site: Margaret Ville is 500 metres from the former Queen's Circus: a busy intersection, then. In the above layout, it is also less than ideal to have bath 2's shower wall sharing the same wall as the stove. Part 4: Case Study of Sales Brochure usually don't show the location of the central rubbish bin(s). Hopefully it is not beside the unit's main door or facing the main door. Please request your respective agent to get hold of the entire floor plan to have a clear understanding of the actual location of the rubbish bin(s). Some developments have two: recycling and common. Many of my clients had insisted on this and yes, if the agent wants to earn your business... will have to get this for you. NW2 has the auspicious water wealth #8 at it's frontage. For this development, the pool water is to the SW of the development, closer to Commonwealth Avenue. Even if no real water at the frontage of these stacks: there is another form of "water". Known as virtual water or simply clear unobstructed view (especially higher floors). This can be considered as an alternative to real water. Here, just imagine birds can fly freely at the frontage of Stacks #04, #05, #06 & #07 is good enough. Some may even want to activate a water position at the balcony to enhance luck. However, this side of the building faces afternoon sun (at an angle) all year round. SE 2 facing has the water wealth star at it's frontage. Again, there is no real water at this side of the frontage. Same goes for the comment similar to NW2 under Para A. Good, if the main door of the house has a "mountain" support. 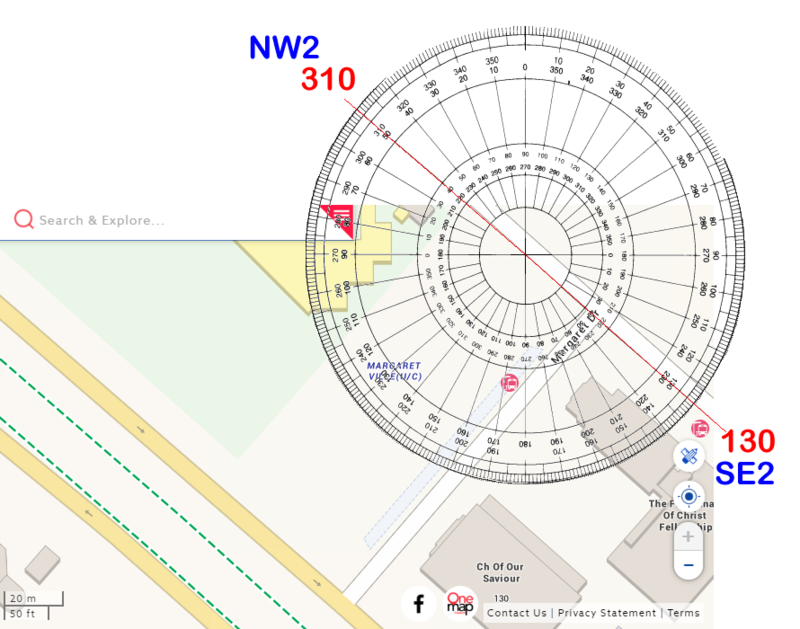 As some sales brochure have inaccurate North compass markings, I need to do an additional confirmation using one of the electronic streetmaps like streetmap.com or onemap.sg . 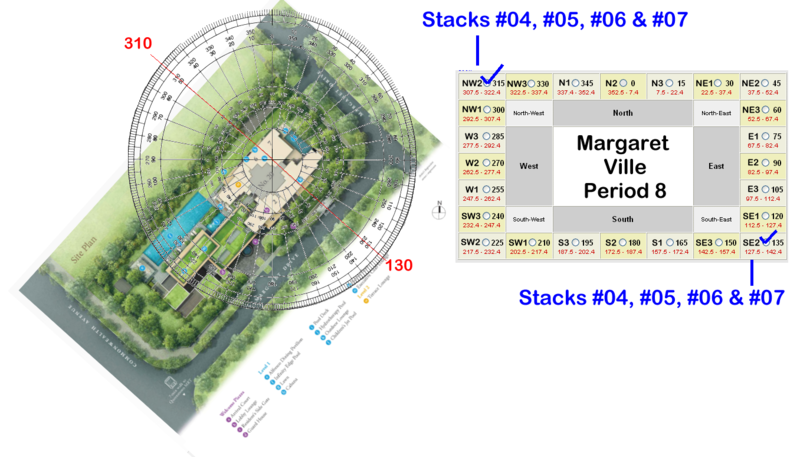 Part 6: Using street map to double check the compass reading taken from the Sales Brochure of Margaret Ville. 1. In the past, there are instances where the Sales Brochure got it's North marking so wrong. 2. As Flying Star Feng Shui requires a compass reading; and since the development has yet to be built or accessible. Such as often, after T.O.P. ; it is often good to use any street map. 3. For instance, I used onemap.sg. This map system uses the government survey data.gov.sg map - done by professional surveyors. 4. As this development follows the contours of the plot of land, I was able to use a protractor to measure the compass degree of the major Margaret Drive road. 5. Good news is that the compass readings identically matched above Part 5 : that of the sales brochure's North marking exactly. 6. Thus, there is a high confidence, here. 7. Most likely the above did not consider the landscaping of Margaret Ville. 7.1. Landscaping is a double-edged sword. As sometimes, the landscape can block these three potential poison arrows. Which is good. 7.2. But in other situations, mature tree trunks of own estate could create a situation of "scoring own goal". 7.2.1 For example, if the tree trunk slices towards a unit's opening such as a balcony opening or windows... this would result the tree being a potential poison arrow. Thus this is like scoring own goal! Part 7: Any external threats - existing or future from nearby buildings (if any). 1. 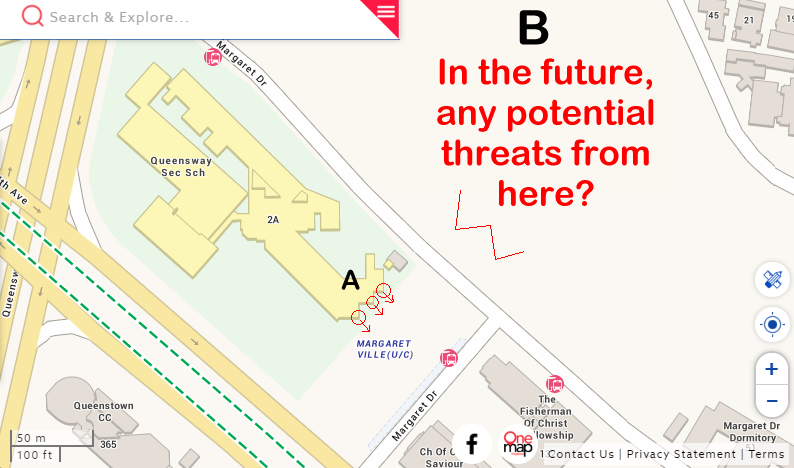 Potential existing threat from Queensway Secondary School zagged sharp corners (poison arrows) as shown by marking "A". 1.1. Hopefully these does not aim towards #04, #05 or #06 (if any) if it is aimed towards an opening such as a balcony or bedroom windows. 2. Another potential poison arrow is shown by marking "B". Hopefully as stacks #07 and #08 don't face NE direction which is the plot marked as "B"; then it is safe to say that there should not be a future threat (if any). Crossing fingers. A. Onsite look at the school building or it's exact height. B. The estate seems to have trees that may one day raise to 3 or 4 storeys high. Caveat Emptor.. let the buyer beware.. Nothing beats going onsite to have a look. 1. Please see below: Especially for those who are considering lower storey stack #07 or even #06; it is good to know what building (circled in red) is? Bin centre? Sub-station? 1.1 Less than ideal if it is a bin centre. Especially since low storeys of stack #07 and even #06 can have a view of it (subject to landscaping at Margaret Ville). 2. "White pollution" or noise from MRT trains on a daily basis during it's official hours. 2.1 This might be a concern for certain floors of stacks #03 and #04. 2.2 As the development has not been built; one can only guess that lower stacks may get train movement noise. 2.3 I am more concerned with this U shaped area marked as "X". 2.3.1 As often, such an area tend to capture or "magnify" train movement noise in particular. 2.3.2 Even if one claim that the MRT trains are running at stacks #04 and #03 unit's side. For some.. could say "what is the issue, here?" 2.4 Of course, lets hope that the noise levels from the MRT trains are not as bad as mentioned above. Plus nowadays, LTA also installs side panels to further reduce noise. Hopefully this helps. 2.5. Thus it is a good thing that planners have placed Margaret Ville Block closest to NE or the main Margaret Drive road side. 3.1. Do look out for sharp corners (if any). Good news is that this is highly unlikely as these buildings are parallel to Block 20 Margaret Ville. 3.2. As the Church building is closer to Commonwealth Avenue; most likely the Church cross is not facing any units. If there is will be at stacks #01, #02, #03 or #08 side. 3.3. Under Symbolism, it is always best to avoid a unit's frontage e.g standing inside the living room looking outwards facing a church spine (cross) or a school clock. Part 9: Avoid posting questions specific to a unit or units. The Feng Shui Master (FSM) says: "You have to buy this." Know that this is FAKE .... Don't enrich that greedy FSM.